Stonebridge is proud to support The Shakespeare Company located right in the heart of Calgary. The Stonebridge team was excited to take part in the creation of an 8-foot tall maze made completely out of re-purposed bottles, right in the middle of Eau Claire Market. Working with Calgary Can, an organization dedicated to reducing waste and improving recycling opportunities by collaborating with the bottle picking community, MacLeod helped bring this initiative to light. In addition to working with Calgary Can, Mckinley Burkart and Entuitive Engineer Consultants were large partners in bringing awareness to local recycling initiatives. 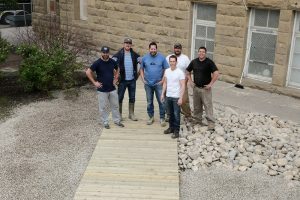 The Stonebridge team was thrilled to build the new boardwalk at Hillhurst Elementary School. This provided safe access from an area that was constantly flooded due to natural grade. MacLeod came up with a solution that connected the paved sidewalk to the newly installed playground.